Mansanilya – Scientific name: Chrysanthemum indicum L.
An erect or ascending, somewhat whitish, hairy herb, perennial, aromatic, 30 to 60 cm high. 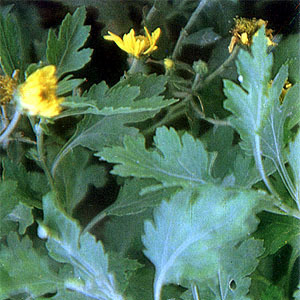 Leaves: thin, pinnately lobed, ovate to oblong-ovate, and 4 to 6 cm long. Lobes 2 to 3 on each side, ovate or oblong-ovate, and sharply toothed. Upper surface of the leaves deep green while the under surface gray-green. Flowers: in heads; heads yellow, peduncled, corymbosely panicled, and 1.5 to 2.5 cm in diameter. Involucre bracts oblong or elliptic, and as large as the achenes. Receptacle smooth or pitted, not paleaceous. Ray flowers 1-seriate, female, ligule spreading, disc flowers numerous, perfect, limb 4- to 5-fid. Fruits: achenes, very small, cuneate-oblong, somewhat compressed and grooved. Volatile oils (kiku oil), 0.16%; glucoside; chrysanthemin, 7%; anthocyanin. Widely cultivated for ornamental and medicinal purposes. Established in Benguet at 1,800 m altitude. Flowering heads. The active ingredient is chrysanthemin. Collect flowers from August to October. Collect young shoots or collect tender portions of the plant. Volatile oil (kiko oil), 0.16%; glucoside; chrysanthemin, 7%; anthocyanin. Preventive for cough, flu, epidemic meningitis. Gas pains: Warm oil, add and mix the flower heads, let stand for 30 mins and strain. Apply warm oily solution to abdomen. Insect repellent: Burn the flowers. Tea used as a wash for sore eyes, open sores, and wounds. Combined with bitter sweet as ointment, used for bruises, sprains, calluses. This entry was posted in List of Medicinal Plants in the Philippines and tagged Indian chrysanthemum, mansanilya on March 22, 2009 by Pinoy Herbs.